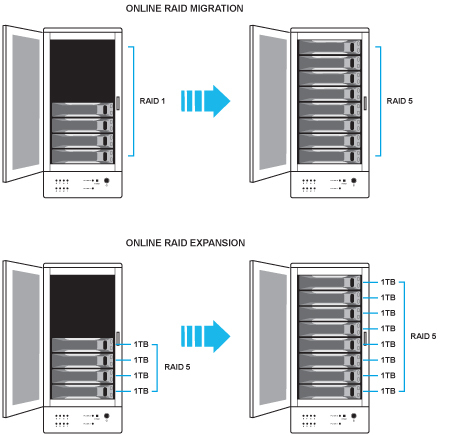 Utilizing dedicated high performance processor and advanced RAID design, TowerRAID Plus Series is capable of real-time RAID mode alteration, and hard drive capacity expansion without the need to erase existing data minimizing down time. This is also no need to move existing data to a temporary location. All changes are performed in the background without interrupting data availabilty. 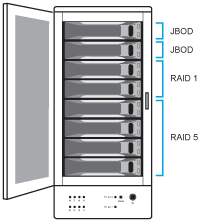 TowerRAID Plus series support smultiple RAID volume, where different RAID modes could be setup within a single unit, allowing flexibility for various environments and applications. A multi-bay tower could be divided into smaller volumes that could be operated and administrated individually.